A relaxed, easy stay with efficient, friendly staff. The quality of breakfast, excellent coffee machine, the relaxation room and the apples made all the difference. We were very impressed with Alto and will definitely book for our next stay in Melbourne. Very good. Only caveat is that I booked breakfast but never tried it as it was way too early for me. I work until late at night as I am working with HQ in the US. Great hotel. New, clean, great staff & very good location. A comfortable, well-maintained room with everything we needed. The breakfast selection was amazing and it was hard to choose what to have! All staff were friendly and helpful. Have stayed with you many times and appreciate your charm and convenience. As always a comfortable stay in a great little hotel. Very helpful staff, we had a very short stay but everything was fine. Good breakfast. Front Desk helpful. Great location with exceptional service. I really enjoyed my time at the Alto. The staff were fantastic and the service was excellent. I will definitely be staying again next time I am in Melbourne. I really enjoyed the little touches like the umbrella in the wardrobe and having a proper hairdryer instead of one of the little ones on the wall. The bed was super comfortable and I really enjoyed the many different channels on the TV. I would not hesitate to recommend the Alto to anyone traveling to Melbourne. It was the perfect base to come back to each day. Location was very convenient to CBD. Free tram rides are right at the door. Staff was very friendly and helpful. We had our one-day tour arranged efficiently by one of your staff members. We enjoyed our stay at Alto Hotel On Bourke. We'll definitely stay at Alto when we visit Melbourne in our next visit. Thanks Team! Been many times - always good. Comfortable, convenient, suited our needs, minor confusion over breakfast times - reception staff were out by half an hour with what they told us. It was a great experience. The hotel was clean, the staff were friendly and the bed was comfy. We had a wonderful stay at the hotel. Everything was nice from the welcoming & friendly staff to the lovely clean and comfortable hotel rooms. Superb , I wish we had stayed longer. The staff were very friendly. I liked the little touches, the apples at the entrance, salt and pepper shakers, glazed windows. The environmental features such as collection of paper, cardboard, bottles, etc. In the bathroom the usual small bottles of shampoo, etc were replaced by generous containers of soap, shampoo, conditioner and bath/shower gel attached to the wall. love staying here , the hotel is clean and friendly. Clean, quiet, well designed rooms! Wonderful, skilled and helpful staff provided great service to us, even after we had checked out (provided luggage storage). Some minor maintenance would be appreciated (for future guests), things like fixtures loose/ not straightened (toilet seat, door handle). The window opened to a brick wall which was uninspiring but glad that we had one and it was quite soundproof. We could tell the king bed was two singles pushed together unfortunately, would be great if staff could figure out a more comfortable solution - better mattress topper, more sheets?? Lovely offering of consumables (for a surcharge) and loved the location of the hotel - perfect spot, close to everything!! Great location, clean room, friendly staff. Close to tourist attractions, shops and the Yarra River.Public transport just outside front door. Easy walking distance to Casino and Southern Cross Station..
Another comfortable and relaxing stay at Alto - keep up the good work! We booked this for our wedding which was held directly across the street so had a full day or bridal party chaos with hair and make-up artists and bridesmaids filling the room but it never felt as cramped as I would have expected. The staff were super helpful in ensuring we had enough chairs and drinks for everyone. I couldn't be happier with our stay. Excellent stay. Will stay here again when next in Melbourne. Staff were lovely, room very clean and comfortable. Only issue was that we were asked to pay for a beer from the mini bar which we did not take, the staff member did not charge us, but it was a bit odd that we were asked in the first place - we wonder if the cleaner mixed up the rooms? Very enjoyable stay, helpful staff, comfortable room. Despite closing both windows, still could hear the trains from Outside. Parking code supposed to work for two days but expired after 24 hours and we had to call the hotel reception to get a new code, incurring international call charges as the call was made from a Singapore-based handphone number. Staff were all helpful and friendly. Breakfast was tasty. Excellent idea to have guest laundry facilities provided, which is fairly rare in Melbourne city. 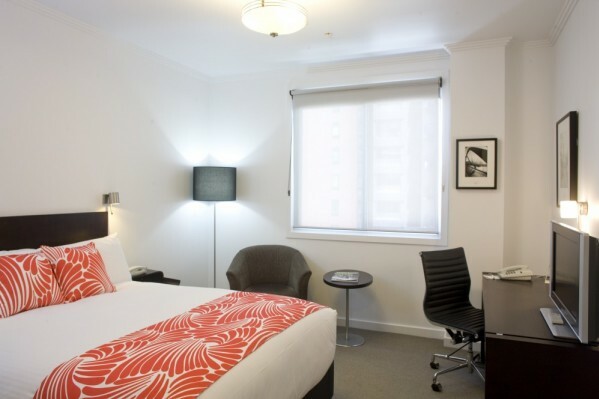 4 of our 50 rooms face Bourke Street where trams run. While all rooms have double glazed windows to minimise sound there may be some minor sounds in these rooms. Excellent. The staff make this hotel. The welcome back choclates are lovely touch. Breakfast is awesome. Ideal position as we were in Melbourne to see COLDPLAY at Etihad Stadium. Bed very comfortable. Made to feel welcome, like one of the family. Very clean with friendly and efficient staff. Rooms very quite particularly considering central location. Also having opening window as an alternative to air conditioning, weather permitting, was a plus. Found not able to access food after 9 pm considering daylight saving - not dark until about 9, was only issue. Other eateries close by also did not serve meals after 9 except of course fast food outlets or bar snacks from nearby hotels, When we did eat at the restaurant the food was delicious. Great place to stay close to Trams, Etihad stadium, casino and walking distance to restaurants and shopping. Great second stay. Will be staying again our next trip to Melbourne.